The comments mentioning "Morans" refer to an internet-famous picture of a protester holding a sign that had written upon it "Get a brain! morans" [ http://farm3.static.flickr.com/2235/2106782847_36bcc72290.jpg ] Perhaps if teachers were well paid and treated with a little respect and If a little more time was spent teaching the basics rather than filling children's heads with religious nonsense, extreme patriotism and sport things would be a little better. Please note: This is English, not American. Is are children learning? Clearly not. Hey buddy, in America we have this little thing called second grade, apparently you didn't attend? 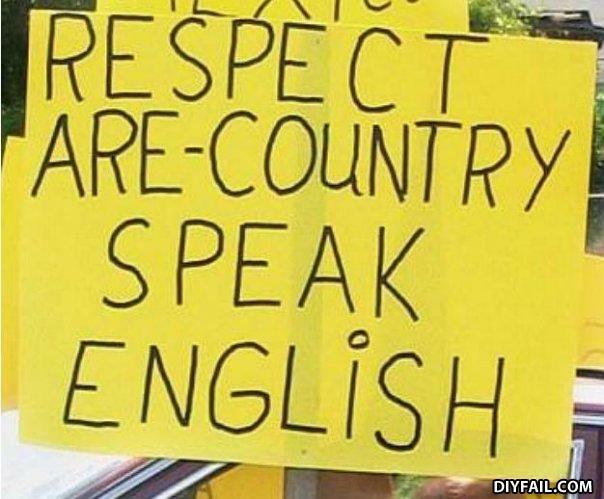 "Maybe they should take a English test! =P"
Don't have to write it, Just Speak It. Or yew failyare with the term "Useful Idiot"? Republicans are split between smart, rich businessmen and illiterate rednecks, I wonder if perhaps one group is just playing the other for votes to create a free market in which the big businessmen can do whatever they want with their big businesses... Nah, that sort of thing doesn't happen in are-country. Did nobody notice the lower case "i" amongst all the capitals? It should say "Respect our Country, f*ck off back to the Middle-East"
How did the lifegaurd break his leg? He was hit by a submarine!